Two Gloucester men sentenced to life in 1990 for a murder they denied committing, have had their convictions quashed by the Court of Appeal. Gary Mills, 43, and Tony Poole, 41, were jailed for the fatal stabbing of Hensley Wiltshire during a fight at a flat in the city. They have always protested their innocence, but refused the chance to be released on licence until their case was re-examined by the courts. Both men have said they will be seeking compensation and pushing for a full inquiry into Gloucestershire Police. The force has said it will not be opening a new investigation into the death of Hensley Wiltshire. In a statement, it said: "The injuries sustained by Mr Wiltshire, which led to his death, have not been disputed and no new evidence has been offered to suggest any other person was responsible for inflicting those wounds." At their trial, Mr Mills maintained he acted in self-defence after being attacked by Mr Wiltshire. Mr Poole said he took no part in the fight. The pair were freed on bail last week, pending the announcement on Tuesday by three appeal judges. They had their cases referred back to the Court of Appeal by the Criminal Cases Review Commission, which investigates possible miscarriages of justice. Lord Justice Auld, Mr Justice Keith and Mr Justice Simon, ruled that the convictions were unsafe for two main reasons. One was non-disclosure of material. The second related to a document wrongly put before the jury which was "unfairly prejudicial" to both men. After being released, Mr Poole said: "From what I can see, the judgment doesn't really go nearly in depth as it should in damning the police. "There is some criticism there but it falls short. I'm not overly happy - it's not enough. "After 14 years, they say a few words and that's it. I'm happy I'm free but it just seems a bit of a let down. "It's just a game of words at the end of the day. You can't compensate for what we've lost. "Nothing will ever make me feel that justice has been done." The police statement read: "We are pleased the court found that there was no evidence of systemic corruption or dishonesty during the police investigation." During the recent appeal hearing, Edward Fitzgerald QC, representing Mr Poole, told the judges: "There is evidence that there was something rotten at the core of this investigation." He said the jury at the men's trial convicted on the evidence of a witness who was a drug addict, and "someone eminently susceptible to pressure from the police". The QC told the judges: "There is every reason to suspect that improper pressure was put on her." In their statement, Gloucestershire Police said: "We respect the decision of the court. "Together with the Crown Prosecution Service and legal advisors, we will be examining the judgement in detail before deciding upon any further action." 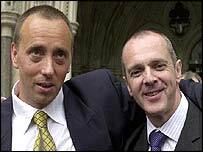 An initial challenge to the convictions of Mr Mills and Mr Poole was rejected by the Court of Appeal in 1996 and that was followed by a defeat in the House of Lords. But in a High Court hearing related to their case in December 2001, the Lord Chief Justice, Lord Woolf and Mr Justice Ouseley, said they believed there were doubts about the safety of the convictions. Police handling of the case amounted to "at least a chapter of errors", they said, and "almost every aspect of the prosecution is tarnished". Gloucestershire Police said: "The decision of the court focuses primarily on the legal process and it must be remembered that the investigation undertaken 14 years ago was run under very different legal procedures to those in existence today."